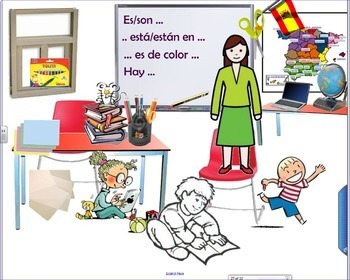 This is the third part in my series of units on the school and the classroom, geared towards third grade (but can also be used in 4-5) and with a cultural focus on Spain. 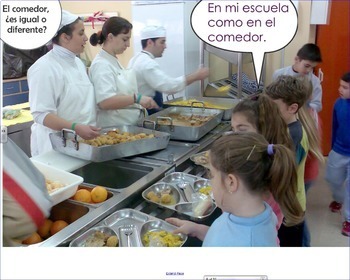 With a series of carefully selected pictures and videos, students get a glimpse of how schools are in Spain, while they learn to use simple sentences (es, está, hay, me gusta) to communicate in Spanish. This unit also includes interactive games, detailed teacher's explanations and suggestions for further activities, links to videos to reinforce the language at home, 2 assessments (interpersonal speaking and interpretive listening), 2 worksheets and printable playing cards. The pages follow a logical teaching pace, that will guide you through the unit. 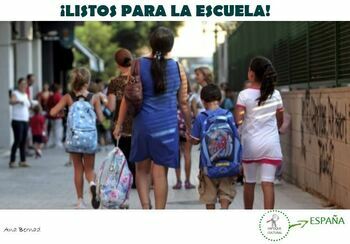 A great resource for a FLES style classroom and aligned to the FL standards, at the novice mid level (standards included). ATTENTION! This is a Notebook file, intended for use on Smartboards.